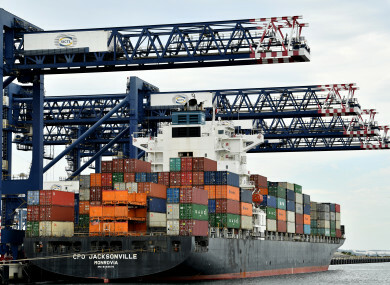 Stock image of shipping containers. DANIEL KINAHAN FACES being named in part of a multi-billion euro cocaine trafficking enterprise following the arrest of a Chilean drug lord. TheJournal.ie broke the news in October of last year that the arrest of Richard Eduardo Riquelme Vega – known as ‘El Rico’ – was to cause serious repercussions in the world of Irish gangland. Distributors of cocaine have been arrested in the Netherlands, the Caribbean, Germany as well as Chile where the South American drug baron was arrested late last year. Approximately 60% of Ireland’s cocaine had been coming into the country via El Rico and his distributors, according to sources. Earlier this month, 440 kilos of cocaine was seized in the Dutch port of Rotterdam. The drugs were destined for the European market. El Rico had been in custody for several months at that point and remains in detention in Chile. The arrest of the alleged drug trafficker has the ability to strengthen the Dutch police’s ability to link him to organised crime in Europe. The arrest of El Rico and the subsequent seizure of his electronic devices can be directly linked to the arrest of several suspected drug traffickers in the Netherlands and Belgium. He had been using a German IT protection system, used by many multinational financial organisations, in an attempt to safeguard his communications. The system can be used to send encrypted messages and, according to sources, leading members of the Kinahan cartel were using it to communicate with El Rico. Dutch police have been attempting to get El Rico to face charges in Europe for nearly a decade. There is currently an extradition process underway. If El Rico is eventually sent to Europe, this could spell the end of the Kinahan cartel in its current form. The cartel is understood to have been cooperating with police in a number of jurisdictions in return for some form of immunity. The seizure of the phones now means that police in a number of jurisdictions have access to El Rico’s records which go back to 2011 – meaning any deal made between him and Irish gangs can be accessed by police. If, as police believe, the phone records implicate the cartel in a number of murders, then it will be very difficult for Dutch police not to prosecute – no matter what current deals have been made with other police forces or intelligence agencies. Senior members of the cartel are now actively trying to make deals with foreign agencies in a bid to lessen the effects of any Dutch prosecution against them. It’s understood El Rico’s phone records will detail drug deals in countries such as the UK, Belgium, France, Spain and Morocco. Gardaí continue to liaise with their international counterparts. Email “The 440 kilo cocaine seizure which threatens to bring down the Kinahan cartel”. Feedback on “The 440 kilo cocaine seizure which threatens to bring down the Kinahan cartel”.